The aura of the Icelandic superstar, artist and pioneer Björk has reached Somerset House in London – and we’ve gone to check it out. Before going in too deep in with the extravagant creative force commonly known as Björk, and why her exhibition Björk Digital is so relevant, I ask you to take a moment to consider what you define as art? And what art is today? More importantly, what it is going to be tomorrow? Apologies if I scared you just there. It is a tricky one, I know. But having just seen this extraordinarily interesting sound artist’s current experiments with virtual reality, sound and image – it really is a legitimate question. The music legend and sound artist Brian Eno once passionately tried to clarify it to me (and many other star-struck students in the room). He claimed that art is everything we don’t need to do for survival. We don’t need to cook and plate beautiful food, we don’t need to have a particular hairstyle, we don’t need to sing, dance, build computers, paint our nails – we don’t even need fashion (sorry Wonderland fashion dept.). We don’t have to, yet we still do it – with such passion! And as I’m leaving Björk Digital I’m proud to say it’s a celebratory experience of it all. A celebration of all expressive arts and so a celebration of creativity. So let’s keep that in mind before any one gets too picky and wound up about where pop-musicians belong and where the ”fine arts” do. Lining up to enter the exhibition you could hear the sweeping, dramatic rhythms of Björk’s tunes luring behind the walls. You’ll instantly be reminded of the childish excitement of queuing for rides in a theme park – add some underground club feel to that and you get the vibe. As the quite unconventional gallery-tour-experience goes on, you get to experience intimate one-on-one performances with Björk through the latest VR technology. An initiative that the artist herself has pioneered by gathering programmers, engineers and sound technicians from all over the world. And before you know it, she’s just there, right in front of you. On a remote Icelandic shore, waves crashes in the background as she dances in circles around you. It’s hard not to feel small as she’s looking you straight in the eyes. She looks humble, her dancing is instinctual and it’s strongly apparent what a fascinating connection she has to sound itself – if only we could borrow some of that energy for the next night out. As I am sat inside Björk’s mouth (yes, inside) while she sings Mouthmantra, I cheekily decide to take my VR headset off to have quick a look around. Everyone was just as lost in virtuality as I was, slowly swaying and spinning around on their chairs. It almost looked like they were all dancing with her, but on their own. As if the mouth thing wasn’t enough of an odd experience. These intimate encounters continue, some more abstract than others, as you are guided through the surprisingly un-polished corridors of the new wing of Somerset House. It quickly turns into a game of floating between virtual and physical worlds until the latter almost feels more surreal than the other. Somerset House’s new wing is a former tax office, which explains why walking around the somewhat rough and weirdly structured rooms is reminiscent of entering some hyper tech lab where Björk’s spirit is captured in every cable, screen and speaker. Looking at the development from Björk’s older projects, it’s obvious that things have changed. Both industry and artist. With a career stretching over decades, she has constantly defined her own genre. Her usually surreal and symbolistic imagery have now gone more abstract and seeps into anything she touches. Trying to keep up with her fierce integrity and captivating motions, I’m constantly questioning whether we are looking at standard music videos with top-of-the-line sound and technology, or if I am to consider this as video installations, or both? Maybe neither? Music has lived through EP’s, then vinyls, cd’s and mp3’s – and right now we are streaming like never before. It becomes increasingly harder for the traditional musician to reach through the masses as they compete with the relentless accessibility of the digital world. Yes, collaborations and video albums aren’t a new thing – so drink your lemonade and breathe for a minute – and I’ll try and figure out why Björk’s unique type of album is relevant in spaces, actual physical spaces, that usually are associated with the ’finer arts’. As the notion of art being static objects displayed in clean white rooms have long been abolished and questioned, a rise of new forms of art has now come around. The line between pop and sub culture is more experimental and pushed on than ever before. We follow underground art collectives collaborate with musicians, social media stars with street artists and clubs with charities. The list goes on. Björk Digital embodies all of this with the boundary pushing eclectic mix of fashion, natural sciences, sound, technology and visual arts – even education and social media (Biophillia – look it up). So perhaps this is what we are to expect from visual culture and music in the years to come, as it redefines itself in a digital world that knows no limits – and maybe Somerset House is a sneak peak into the future of it. Yes, Björk’s own universe really exists. So get your tickets now and immerse yourself in the extravagant Icelandic glory that just came to town! Meet the artist exploring loss and mental health with an intensely personal installation at Somerset House. 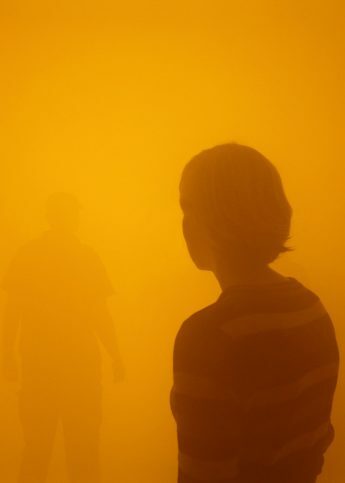 Icelandic-Danish artist Olafur Eliasson will fill the Tate with fog for his latest immersive exhibition.